Intertidal mudflats and estuaries often have high levels of cadmium, and the invertebrate prey living in the mud bioaccumulate this heavy metal. At stopover sites, birds consume more food than they require for maintenance because they must fuel their migration northward. The birds are at risk for consuming high levels of cadmium and other heavy metals like mercury and lead. However, metal accumulation is often site-specific, with highest concentrations in large urbanized estuaries such as San Francisco Bay and Boundary Bay, B.C. or along urban channelized rivers, which receive urban runoff, such as those in southern California. Other suspect stopover sites that might have contaminants are Grays Harbor (Washington) and Humboldt Bay (California). 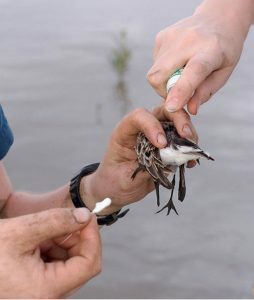 Comparison of cadmium residues among sandpipers of increasing age suggest that exposure is occurring along the Pacific Coast, at stopover sites as the birds migrate north to Alaska and south to Panama. This study points to the importance of considering the ecology of the species (e.g., in this case migratory behavior) in interpreting trace metal residues. Mercury and lead are also other heavy metals known to bioaccumulate in invertebrates that live in mudflats. The toxicity of cadmium in sandpipers may be increased by the coexistence of other heavy metals in their bodies. At present we are analyzing blood and feathers from western sandpipers, collected in 2006, for all traces of heavy metals. We will post the results soon.